"Shadows of the Past, Part 4"
Outside an empty warehouse, Angel and the Purple Dragons lead the Turtles and Casey to the heavily guarded entrance. Raph gives Angel one last opportunity for her gang to get in on the action, but considering the stranglehold the Foot have on the New York crime scene, Angel declines with the safety of her neighborhood in mind. Inside, Splinter and the Shredder continue their epic duel. Splinter uses his memories of his past life to fuel him in battle, but unfortunately his fight against the Foot Soldiers has left him weary and he cannot keep up with Shredder. Eventually, Shredder succeeds in taking Splinter down. Raising his gauntlet, he prepares to execute Splinter a second time. Suddenly, the Turtles and Casey come bursting through a window (after breaking the glass with the unconscious body of a Foot Soldier). 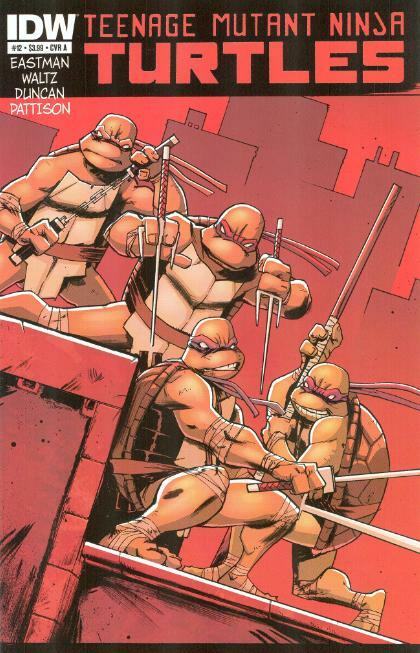 While Leo goes toe to toe with Karai and Casey and Raph have their long overdue rematch with Alopex, Donnie and Mikey rush to help Splinter to safety. The Shredder, however, won’t let them leave without a fight, as dozens of Foot Soldiers swarm from the darkness. 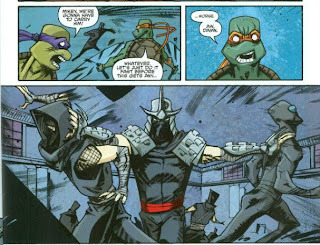 Leo successfully takes down Karai and Casey and Raph knock out Alopex, though Donnie and Mikey are getting trashed by the Shredder. Splinter, injured, reminds his sons that the only way they’ll win is through teamwork (Shrdder is shocked to hear that the Turtles are Yoshi's offspring reincarnated). Casey attempts to get Splinter out, but is blocked by a hulking Foot Soldier. 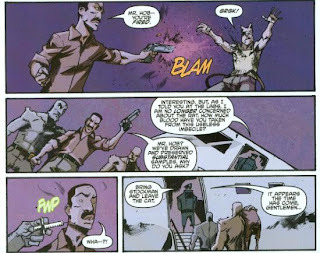 Luckily for him, Angel shows up and knocks the brute out, claiming that she’s paying Casey back the favor she owes him. Together, they get Splinter out the window. Considering Splinter’s instructions, the Turtles band together and confront the Shredder. Shredder scoffs at Leo, reminding him of his defeat during their battle at the construction site. Leo is shocked to learn that the scar-faced Foot Soldier he lost to was the Shredder, but then reminds his foe that he’s not alone this time around. The Turtles charge and each get a lick in before backing the Shredder against a wall. Realizing that their task has already been accomplished, and staying around would be foolish (and accepting Shredder’s offer of membership would be even more foolish), the Turtles escape. Before leaving, though, Leo tells the Shredder that he’s “unimpressed”. At an airport, General Krang boards his plane, telling Stockman that he’s out of chances. Stockman vows to make improvements in his efforts, first by shooting Old Hob in the chest with a handgun. Krang tells Stockman that he’s no longer interested in the psychotropic compound exclusive to the rat’s blood and asks how much mutant blood he drew from Hob during their partnership. Stockman says that he has plenty, which is all Krang needs to know. Tragg drugs Stockman and carries him onto Krang’s plane, leaving Hob behind to die. At the 2nd Time Around shop, Angel bids Casey farewell just as April comes back. She is moved to tears to see Splinter unconscious and so badly injured, but the rat comes to and they recognize one another. Splinter asks April why she cries and April says that she feared she would never get the chance to thank him for saving her life. *This story is continued from TMNT (IDW) #11. The story continues in TMNT Microseries #6: Casey Jones. *Raph and Casey fought Alopex in TMNT Microseries #1: Raphael. *Leo previously fought Oroku Saki (incognito) in TMNT Microseries #4: Leonardo. 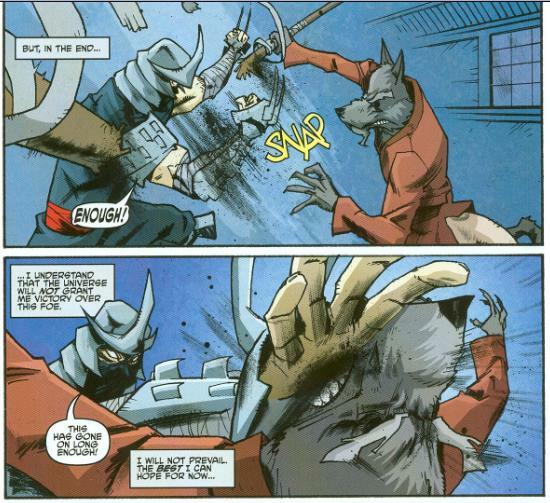 *Splinter (as a rat) saved April from a Foot Ninja attack in TMNT (IDW) #2. *This issue was originally published with 3 variant covers: Cover A by Duncan and Pattison, Cover B by Eastman and Pattison, and Cover RI by Ryan Ottley and John Rauch. Has it *only* been a year since this book began? Or has it been a year *already*!? I’m torn on which manner I should be reacting. I mean, on the one hand, in twelve months we have gotten a total of 19 TMNT comics (20 if you count Hero Comics 2012 #1). And then there’s all the reprint collections of classic material in hardcover format, trade paperback collections and in colorized reprints. In one year, IDW has pumped out a TON of Turtle comics and just looking at the catalog you’d be hard to believe it only represents twelve months of license acquisition. They haven’t wasted any time, that’s for sure. On the other hand, though… time flies. IDW’s TMNT still feels like the new kid on the block; like it was just yesterday that I wrote a short article describing my hopes and apprehensions about IDW getting the license. That was in April? Of last year? Man, getting old doesn’t take as long as it used to. Anyway, Waltz, Eastman and Duncan wrap up Year One by giving us what we’d been waiting twelve months to see: The Turtles fight the Shredder. On a visual level, it satisfied my expectations by, well, giving me what I’d been waiting to see. On a storytelling level, this issue played out pretty much precisely how anyone would expect it to: The Turtles save Splinter and the Shredder swears vengeance. Even Angel’s dramatic last minute save was pretty cliché. Though just because this issue played it by the numbers, that shouldn’t necessarily be a knock against it. By this point, the twists and turns of the story arc had already been laid out and now it’s time to just fight, already. In a comic written like this, you simply can’t take an individual issue and judge it strictly on its own, as it’s one component in a larger whole and can’t really survive alone in the wild. The battle in this issue isn’t just some dull action sequence, but the end result of several networking plot lines, even “meh” ones like Casey and Raph getting a rematch with Alopex. Since this is mostly a “fighting issue”, though, the heaviest burden falls on Dan Duncan to make it interesting. As his last issue of the series before departing to work in TV animation, Duncan produces a comic that lives up to his standard. While the layouts are no great shakes, one thing Duncan has always excelled at has been creating a great sense of motion. I love the way he blurs punches and kicks with his inks; making the end of the limb vanish in a wave of heavy black lines; it’s very distinctly his thing and I’ve loved it. And the sequences where Mikey shits a brick at the sight of the Shredder charging his way, shoving his own Foot Soldiers to the side, was pretty damn effective. If I had one problem with the action in this issue, it’s that the Shredder strikes Splinter again and again with the blades of his armor, but not a drop of blood is spilt. Even more than that, at the end of the fight, Leo lands a dramatic slash across the Shredder’s unprotected torso and Saki can be seen gripping his wound… but still no blood. I’m not asking for gore and guts and stuff like that, but there’s a major disconnect when you see someone getting hacked and slashed and yet they display no physical injuries. Even at the end, April is crying over Splinter’s grievous injuries… But he looks A-OK to me. I understand that Nickelodeon and IDW want to keep this book accessible to young readers, and believe me I think that’s great; but the idea of someone getting hacked to bits by razors and not spilling a drop is ridiculous (remember in the 4Kids cartoon when the Shredder would punch the Turtles with his gauntlet blades and they’d just fly away in the other direction?). On the other hand, some black ink sprays out of Hob’s chest when he gets shot, so at least they’re somewhat acknowledging the idea that fluids exist inside the human body. Speaking of Hob, I’m conflicted as to whether I want him dead or not. The guy is so far beneath the skill level of the TMNT that he was a joke of an enemy by the end of the first issue. His reason for hating them is flimsy as Hell and, I dunno, I just wouldn’t miss him that much if he never came back. I also find myself feeling that way about Alopex, as all she’s done since she was introduced is lose fight after fight after fight. Karai also takes it on the chin in this issue and the Shredder gets taken down, too. This goes back to my criticism of TMNT Microseries #4: Leonardo, which introduced the Foot as cardboard targets to be handily knocked down in battle. If you’re going to introduce a villain, make them a challenge. If the first thing they do is lose a fight after only a couple of pages, their credibility sinks before they’d even had a chance to build it. Twelve issues, one year and I honestly don’t think that the Turtles have fought a single truly worthy opponent (except maybe Shub Nigguroth, I guess). Even the Shredder is shown to be a chump the moment the Turtles remember that they can use “teamwork” to solve their dilemma. After Leo makes his “family” speech, the Shredder gets wrecked in under two pages. What I’m honestly more curious about, and what I’ve been curious about since this all began a year ago, is what Krang’s plans are. It looks like bad times ahead for Baxter; the mention of mutated blood samples leads me to think he’s got a rotten future ahead… insect-man or otherwise. It isn’t that I’m disinterested in the machinations of the Shredder and the Foot, it’s just that they’ve been a staple of every incarnation of the Turtles for the past 25+ years. Krang, the Rock Soldiers, Dimension X, the Neutrinos… those are all ideas we haven’t seen to any considerable extent for quite a long time and I’ve been thrilled at the idea of seeing an updated take. I want to know where THAT’S going. TMNT #12 is, on its own, a pretty dull issue, yeah, but you aren’t supposed to be reading it on its own. Taken as the big showdown after a year of build up, it’s a mostly satisfying brawl. I still stand by my qualm that the villains in this book feel too small time and not threatening enough to create a proper sensation of suspense and tension. Quite frankly, I’d be happy to see the Turtles lose a few more fights just to help them build character. "On the other hand, some black ink sprays out of Hob’s chest when he gets shot, so at least they’re somewhat acknowledging the idea that fluids exist inside the human body." "Quite frankly, I’d be happy to see the Turtles lose a few more fights just to help them build character." Every great sage needs an "Empire Strikes Back" chapter to get the villains back up to respectability! Let's hope that IDW Year Two will do just the trick! As for Baxter's fate, I'm starting to get suspicious about the identity of that creepy looking character hiding in the shadows of the April O'Neil micro-issue! Welcome back Mark, was waiting to see your review of the 12th issue. Glad I'm not the only one who thinks that they need to step up the threat of the villians. Especially considering the Turtles have only had 11 seasons and 15ish months of real training. At that point I think they would be walking away with more losses than victories on their tickets. Maybe Old Hob will become Verminator X?